Fishing around in your own brain is dangerous work. There are a lot of scary and strange things going in our minds. It helps if there are other folks around to inspire or possibly even guide us on that journey. 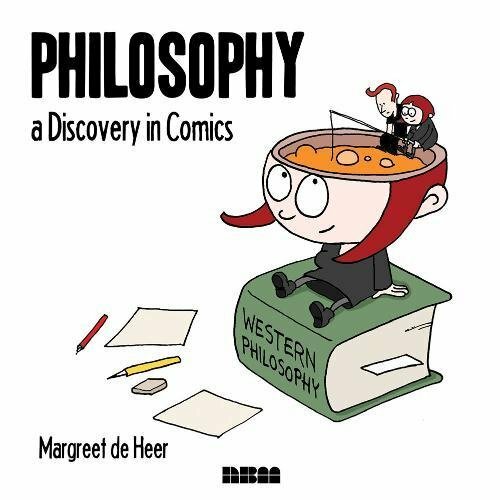 Cartoonist and writer Margreet de Heer makes that trip to the mental fishing hole much easier to understand and deal with in her new book Philosophy: A Discovery in Comics. Reducing all of Western thought into an easy to understand narrative is a daunting task. Using the deft touch of an artist’s pen and a clear passion for what she is writing about, Ms. de Heer manages to do the near impossible. She encapsulates the major ideas of Western thought into a simple and honest narrative. At the same time she makes it so interesting and personal that we want to see where she ends up. Opening the book with an image of herself as an inquisitive five year old, Ms. de Heer quickly reminds us of something we have all forgotten as we have grown older: what it was like to have such big questions so early in life. Little Margreet asks questions compulsively. She wants to know the universe. She wants to know why we are here. She wants to understand a blade of grass and infinity at the exact same moment. She would also like some proof that we aren’t really robots. As we watch her quickly pass through the next 30+ years, Ms. de Herr subtly reminds us that as we age, our questions may remain the same. But the way we search and process those initial questions changes over time. From the very first page and throughout this beautifully illustrated book Ms. de Herr takes full advantage of the boundless originality found in the graphic novel format. In the second panel of the book she has herself grabbing a thought balloon from the first panel and addressing it directly as an object. It is a wonderful moment that immediately lets the reader know that, like philosophy itself, there are no real boundaries in the way the artist and writer is going to address the questions posed to us by our minds. As we move through her biographical-based first chapter we realize that we can all easily identify with her search for meaning. The thoughts and questions she poses are indeed universal. The act of questioning itself is indeed a shared experience. Her early days in wonder and thought and deep inquiry are spent alone. Just like much of our own early days were as we tried to find and better understand our own place in the world. It is when her husband Yiri (who is also the book’s excellent colorist) is introduced that de Heer begins to realize something key to all of our lives. We need others in our life to show us alternative ways to think and perceive. As the rapport between her and Yiri begins to grow, she introduces self-awareness, symbols, thinking, language and other concepts of our existence that many of us have long take for granted. By bringing us back to the basics of thought itself she sets us up for the introduction of the big thinkers. But before Socrates, Plato, and Aristotle show up she needs to remind us of one very important point. As we follow her and Yiri through the centuries she introduces Augustine and Aquinas. We see how philosophers worked to incorporate the idea of god into their thought without betraying what they were thinking. As time moved forward a theocratic state had developed out of the rubble of the Greeks and Romans. Those who publicly looked for answers to the universe had to make sure they never forgot about their relationship with a divine being. The thoughts of the Greeks are combined with the dominance of Christian thought into something new. Nearly two thousand years of searching and it can be argued that the answer is essentially unchanged! The dialogue between Margreet and Yiri reaches its greatest exchange when she goes on the road to talk to friends and relatives about their own philosophies.